Isn't this a pretty stamp. 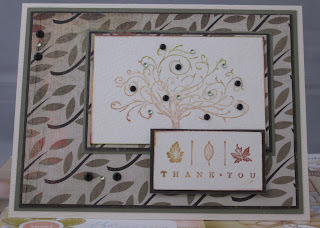 I stamped it on the back side of the K&Company-Ancestry designer paper. I think this will make a nice Birthday card for a bird loving rellie. 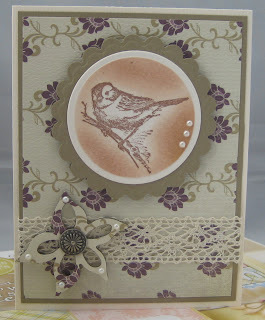 Supplies: cream and chocolate malt cardstock, Designer paper-K&Company-Ancestry, Magenta-Crafty Individuals-2 beautiful birds, Making Memories – Antique brads, misc ribbon, Kaisercraft pearls. Hellooo from the absent blogger. Not sure where the time is flying but it is gone. I have not been overly creative much to my dismay. I have been playing with my stuff though, but more trying things out that creating. This is a Mother's Day card, my mother-in-law loves birds so I try to use them as a focus when I can. This picture highlights the brown in around the focal image quite a bit but it really does not stand out that way in real life. I have been using Doublemates cardstock, it is doublesided with coordinating colors on each side with no white center for my layers. The flower is a 2-D design, I used Sizzex flower #4 die cut to create. The first layer is the Chocolate malt cardstock with the second layer DP, I used foam tape in between. 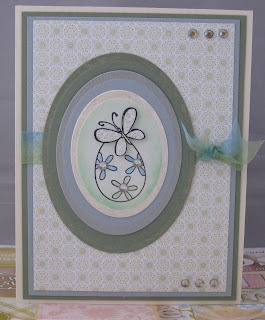 For the circle dies I used Spellbinders Nestabilites, Circle and Circle Scallops. I added Kaiser Craft pearls to finish it all off, I though they matched the lace ribbon nicely. Supplies: cream and chocolate malt cardstock, Designer paper-Enchanted whimsical-Upsy Daisy Designs, Inkadinkado – Sparrow, Kaisercraft – Pearls, lace ribbon. I sat down last night for a short time to play with my crafts last night. I watched a video on using Peel-offs, adhesive tape and glitter. It looked fun and maybe a little tricky but I wanted to try... I have glitter EVERYWHERE, I apparently am not qualified to make this particulate task work for me. Thank goodness for my glitter cloth. I will take a picture of the result over the next day or so. 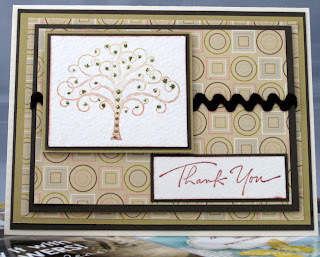 This card was a simple thank you for a wonderful, beautiful handcrafted gift. Thank you Judy and Barry. Supplies: cream, brown and olive cardstock, Designer paper-Scrapbook Walls-Garden Flower Pots, Inkadinkado-thank you, Hero Arts-Scroll Tree, brown rik-rak ribbon and Stickles. Coffee anyone… I am more of a tea drinker myself but my husband has a co-worker that has coffee for blood so I thought this might make a good Birthday card for him. It took me awhile to get the hang of working with the Hot of the Press Dazzles but now I love them. Paperwishes has a large selection. I did not even might cutting out the little coffee bean at the bottom. 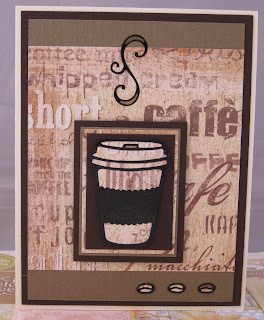 Supplies: Cream, brown and craft cardstock, Designer paper - Flair Designs - What's Cooking Coffee Talk, HOTP –Coffee and Tea Dazzles. I have the nastiest cold that arrived last weekend. It is safe to say that there was no creativity flowing in my craft room this week. If I am lucky I might play with some cardstock this up coming weekend. This card is much lighter then this image depicts, I try to use natural light to take the pictures but we have had a lot of gloomy days lately. I have a new ink pad that I love, well it is not new but new to me, it is a Colorbox Pigment Option Pad. It had all these small pads that can be interchanged. This one had Brown, Moss Green,Copper, Topaz, Cocoa, I dread when it will run out of ink as I have not seen this particular one around. Refils may be an option but so far tis good. Supplies: Cream and green cardstock, Basic Grey – Wassail Olive branch Designer paper, Inkadinkado-Flourished Fall Tree,Stampin’ Up! Take Three(Thank you), misc green and black gems. 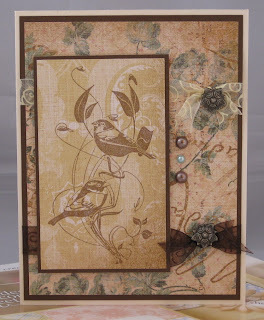 I used Memory Box - Spearmint designer paper for this card. The delicate little flowers on the egg are coloured with my spica glitter markers then I finished the card by adding gems. I wanted to try for simple Easter cards this year and I liked how this one turned out. 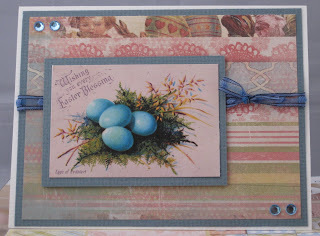 Supplies: Cream, green and blue cardstock, Memory Box – Spearmint Designer paper, Great impressions- Whimsical Flowered Egg., Spellbinders-Classic Large Ovals Nestabilites, Sheer Creations ribbon, Offray-Petite Gems. This is an attempt at Vintage Easter, not bad but needs work:). I like the simplicity.